To convert enemies into frogs is a dream of every decent man. To covert dust into gold can every decent witch. 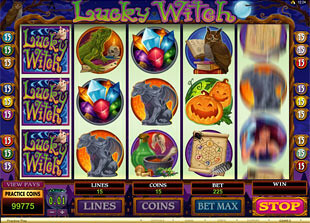 Try and make your DEEPEST desires come true with Lucky Witch slot machine released by Microgaming at any no deposit free spin casinos. This 5 reel 15 line slot invites you into the mystic world of miracles that is also available in no download format. Just make your profitable poison directly through the browser. 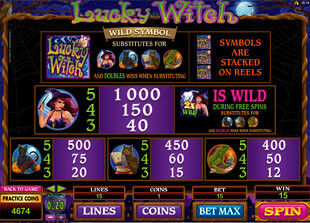 Lucky Witch Logo is the wild symbol. It can really WORK MAGIC and substitute for such symbols as Witch, Cat, Lizard and Owl to produce more winning combinations. What is more, this symbol also doubles your winnings. Just catch it on the payline. Potion is the scatter symbol. 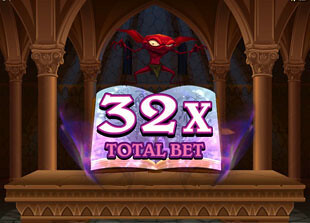 With 2, 3 4 or 5 Potion symbols scattered on the reels you will multiply your total bet by 1, 3, 5 or 200 times accordingly. Play with the maximum total bet of $60 and win up to $12,000 per spin. The more Potion, the more Power. You can invest into your MAGIC LESSONS choosing among coin sizes that range from $0.01 up to $0.20. To play with all 15 lines and spend minimum you should choose penny coin size. In this case you spend $0.15 per spin. If you want to get the best prizes possible, you should play with up to 15 coins per line. Thus, you will be playing with 300 coins per sin. Choose the coin size of $0.20 and the maximum total bet to play with guaranteed. It is $60. To win the top jackpot of 20,000 coins or $4,000 you need to collect 5 Witches playing with the maximum coin size of $0.20 and 15 coins per line. Of course, you can win the top jackpot of 20,000 coins playing with any option, but to convert it into huge sum you need to choose the maximum. 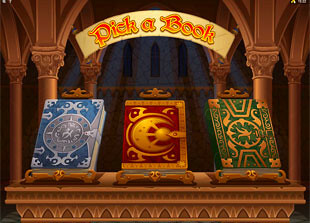 To activate lucky 13 Free Spins you need to catch at least three Potion symbols on the reels. Let the CRRRAZY PARRRTY begin with so much potion to forget about HANGOVER. SeXXXy Witch is the wild symbol too. And she also doubles your prizes. Try to meet her with Lucky Witch Logo to quadruple your prizes. With three Cauldron symbols you activate Mystic Bonus Games. Yeah, there are several of them. To be precise, four bonus games. If to drink potion is all you need to become happy, choose among 12 bottles to reveal the best prizes. The game will be perfect if you find All bottle. The bonus feature ends when you select Stop bottle. Pumpkin Bonus Game provides you with three attempts to choose the most PRECIOUS pumpkin. Click Yes and No buttons to continue or collect your prize won. Don’t be too greedy. Otherwise, even magic won’t help you. To become a real WIZARD or WITCH you need a magic spell book. Choose the best among three offered, meet your DESTINY and discover your prize. If money is all you need choose among 3 vaults during Secret Vault Bonus Game. Afterwards, you need to choose among these three vaults left. Just believe in super powers that WISPER you the right answer and choose the best.